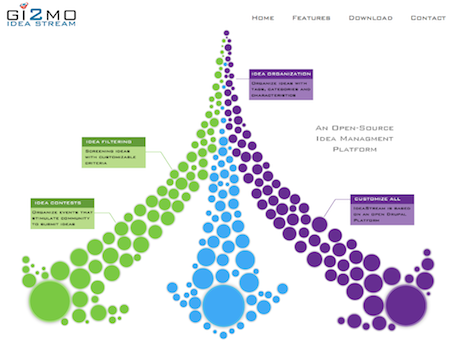 The primary goal of Gi2MO project is research, however in parallel to our investigative work we have put quite some effort into development of software such as our open-source Idea Management System – Gi2MO IdeaStream. We noticed that often people who come to us and want to use IdeaStream are just starting their adventure with innovation management. So often IdeaStream is being used as a tool to play around with ideation concepts and test how they work in practice. In those cases, for newcomers, the complexity of research solutions and information about our work on large scale installations can be overwhelming at the first glance. For this reason, we are lunching an additional new website – exclusively for promoting Gi2MO IdeaStream! The goal of the new IdeaStream homepage is to focus only on the software and explain the very basics of Idea Management as it is implemented by our platform. Keeping that in mind, the main Gi2MO website, as well as this blog, will still remain the central information point for our project where you will be able to find all updates on research as well as development.